Baylor defensive tackle Andrew Billings is expected to be ready to play in the Bears' next game on Nov. 5 at Kansas State. If losing quarterback Seth Russell isn't a playoff-killing injury, maybe the absence of star defensive tackle Andrew Billings. 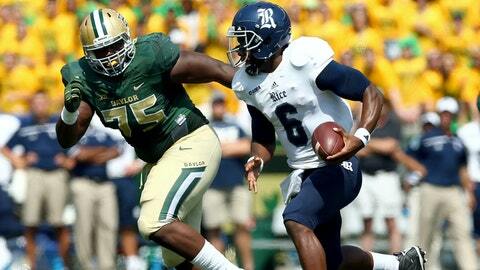 Fortunately for the Baylor Bears, it appears they won't have to find out. The 6-foot-2, 310-pound All-Big 12 lineman and All-America candidate should be ready to play in No. 2 Baylor's next game on Nov. 5 at Kansas State. Billings, tied for second on the Bears defense last year with 12 tackles for loss and already has nine this season, left in the third quarter against Kansas on Oct. 10 with an ankle injury. X-rays determined he sustained a sprain. He played the next week against West Virginia, but did not play last week against Iowa State. Baylor defensive tackle Andrew Billings on pace to return from sprained ankle for Kansas State on Nov. 5, coach Art Briles said.